Q: What made you choose Osteopathy? A: I have the BEST job ever ! The goal of my treatments are to support the human body’s marvellous ability to healitself; alleviating painful and uncomfortable symptoms for people of all ages. Q: What is your favourite partabout what you do? A: I love treating all conditions and all ages, however, I do have a particular interest in cranio sacral therapy, myo facial release and visceral manipulations. Q: What inspired you to become Osteopath? A: I became interested in osteopathy when I was a child after having osteopathic treatment for ankle pain. I was fascinated with how the osteopath relieved the pain with only two or three treatments and without even working on my knee. He explained that the problem was originating from my back.This fascination never wore off! Q: What kind of education does a Osteopath need? A: I completed a rigorous five year post-graduate training program, which consisted of 5000 hours of in-class instruction and over 1500 hours of clinical practice, as well as a research thesis. Q: Does my insurance cover your services? A: Yes, most insurance companies have coverage for osteopathic treatment. However, you should review your benefits package just to be safe. Q: Why did you choose to live in Canada? A: Your country is an amazing,welcoming and charming country. It gave me the exceptional opportunity to enjoy my job and live the lifestyle I always wanted. Q: Recently you went to Haiti, what was your experience? 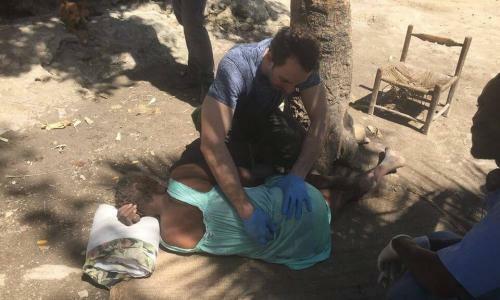 A: With 3 other osteopaths we worked in a Haitian hospital to share our knowledge with physiotherapists and offer osteopathic treatments to patients in post-surgery, neonatality and rehabilitation. A: I am an experienced and caring osteopathic manual practitioner who is passionate about treating all my patients with a holistic approach to total body health. I graduated from the esteemed Institut DauphineOsteopathie in Paris, France for a master degree. I am fully insured in Ontario and Quebec, registered with theFederal Register of Osteopaths and am a member of the SOCATO Association. I always strive to give the best of care to my patients, and additionally to assist and encourage them to have a healthier and more active lifestyle. I am always inspired when I see someone’s determination to overcome challenges, and I feel blessed when I’m able to help clients reclaim their health and purpose in life. Q: What health conditions can an osteopath treat? A: The treatments are commonly beneficial for any type of illness, injury or stress including head injuries (headaches,migraines, TMJ, concussion), neck and back pain, digestive issues, musculoskeletal disorders, stress, anxiety issues and more. It’s appropriate for patients of all ages: infants, children, teens, pregnant women and the elderly. It can also help those with debilitating illnesses, significant trauma or recovering from recent surgery. Q: What can I expect in a session? A: Osteopathy uses a gentle hands-on approach to assess,diagnose and treat almost any healthcare issue. It’s is safe, gentle, efficient and most importantly, effective. Q: Do you have a memorable case? A: I have some very memorable cases, but the last one was with a women. I helped her to relieve musculo skeleta disorders in relation with her posture in front of her computer. One session was enough and her gratefulness affected me. I have had many motivated patients who work hard to understand their patterns of health and disease. Better selfunderstanding and compassion is what leads to lasting change.